For the last three years in late September, Toronto has hosted the Canadian leg of the International Chocolate Awards. Chocolate makers and craftspeople from around the country send in their entries to be blind-judged by a panel of expert judges. Bon bons and flavoured bars (with and without pieces or inclusions) are amongst the categories that are judged over three days. The results? A delicious representation of what this country has to offer. There are 11 regional competitions prior to the world final that happens in London, England every year. In addition to that, there are two supporting competitions in cacao-growing countries aimed at helping the chocolate market and producers/farmers develop—this competition considers chocolate as more than just a sweet treat. 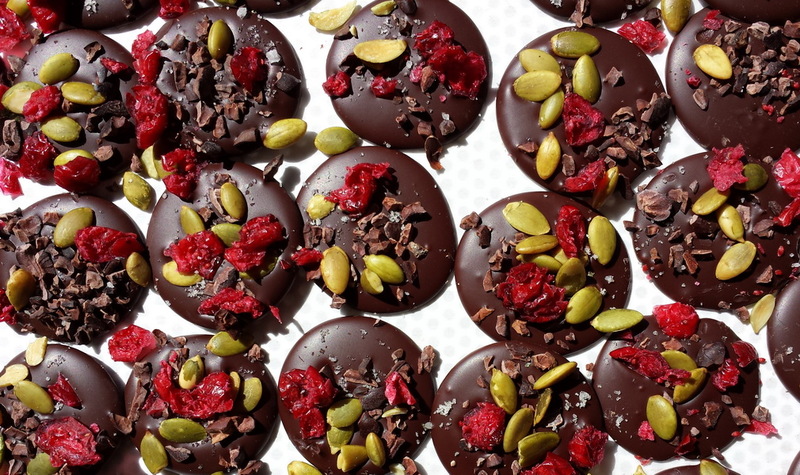 This competition considers chocolate as more than just a sweet treat. Some of the trends that Christy and U.S.-based Permanent Grand Juror, George Gensler, noticed this year include the use of Theobroma bicolor (as ChocoSol Traders did), and employing innovative techniques in micro batches to produce interesting and exciting products. “When you make a micro batch, you can do something you can never do in industrial production,” says Christy. He cites Ontario’s Hummingbird Chocolate Maker, who created a PB & Joy bar in which they grind roasted peanuts with the cacao while they’re making the chocolate, as a good example. Both Gensler and Christy agree that Canadians are “up there” for their creative, innovative techniques with opposing flavours in the white chocolate category. Calgary’s Cochu Chocolatier Gingerbread Bar (silver award winner) is a remarkable example. It has a bit of gingerbread snap amidst a creamy, warmly spiced chocolate. Edmonton-based The Violet Chocolate Company’s Turmeric and Pomegranate white chocolate bar (silver winner) is another taste sensation. “Take away the traditional idea of a very sweet white bar. These examples represent super creative stuff. Japan and Canada are the best in this category,” says Christy. Other trends include the integrated use of roaster or barista type coffee in bars. The same can be said of black tea and chai tea spices in bon bons and bars. Canadian chocolate is finally getting its just desserts. Entries are up by 40 per cent this year, and the world is taking notice of Canadian chocolate. “Sophisticated but munchy and yummy at the same time. High end candy in the best sense. Nice dark chocolate with beautiful toffee pieces and cacao nibs which make it irresistible”. Click here to see the list of Canadian winners segmented into categories. Photo courtesy of Hummingbird Chocolate Maker.